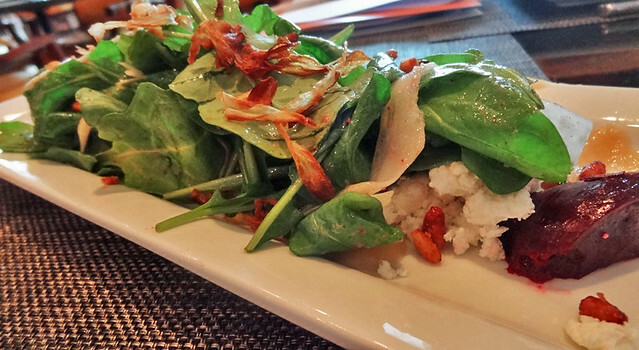 One of the interesting things about Columbus is that it’s a huge food city. Even the dive bars serve upscale meals, which is something I’m not used to at all! I was shocked to see that the Columbus dive bar reviews on Yelp were mostly about the food. 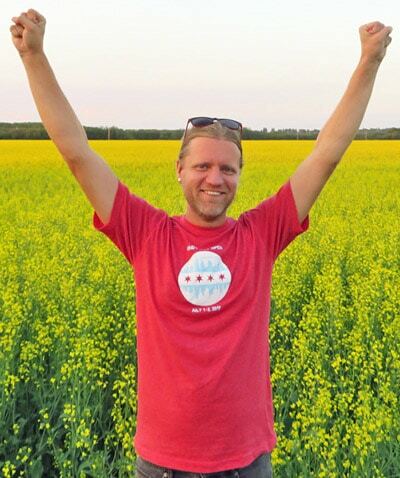 In Chicago, nobody goes to a dive bar for the food. 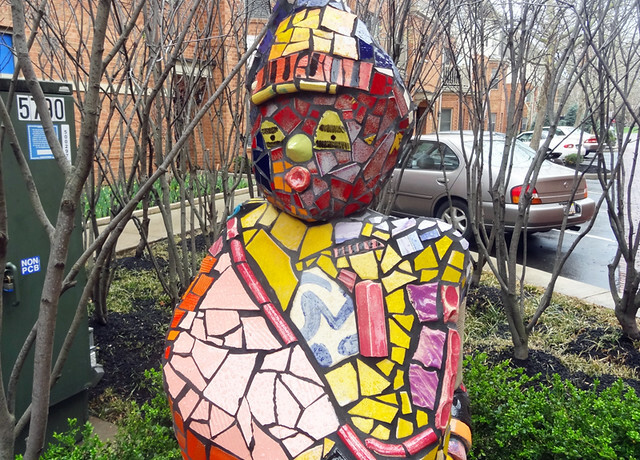 In Columbus, they do things differently. As I scarfed down a turkey burger and huge pile of tasty sweet potato fries at the Short North Tavern, I quickly realized I could get used to this “great food in dive bars” thing. Latitude 41 will never be mistaken for a dive bar. It provided a great lunch with interesting dishes like lobster mac & cheese and this beet salad. Then there were the desserts, like these chocolate-peanut butter “buckeyes” from the North Market. I’ll take all of them. 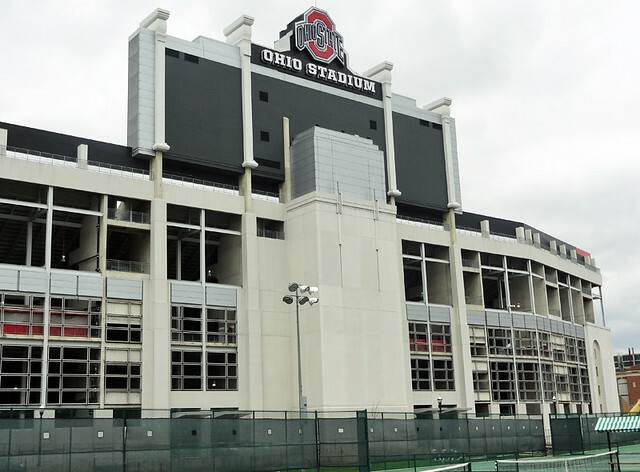 Speaking of Buckeyes, no visit to Columbus would be complete without checking out the Ohio State University campus. As a Penn Stater, I will never root for Ohio State, but I have a healthy respect for their athletic accomplishments. 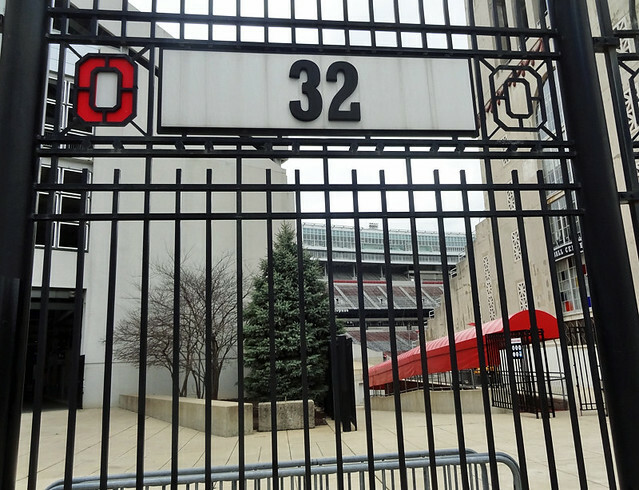 There’s lots of history inside the 106,000-capacity Ohio Stadium. 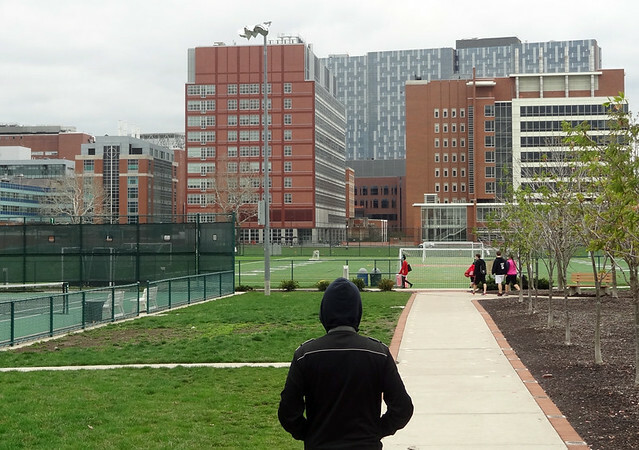 I walked around one end of campus near several athletic buildings and dorms. Ah, college. For a brief moment I was reminded of that nostalgic feeling of walking around campus with no real-world responsibilities and the ability to sleep until 2 pm. 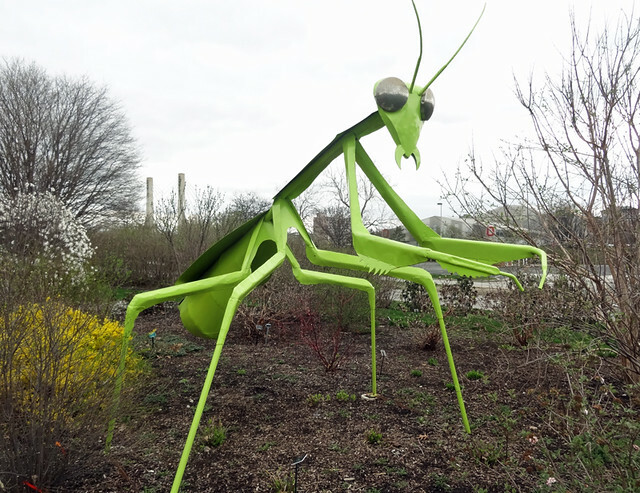 I searched for the campus’s quirkiest attraction, a giant praying mantis. Her name is Anabelle. She’s in the Phenology Research Garden next to the Woody Hayes Bridge. Don’t mess with her or she’ll bite your head off and consume you before you realize what’s going on. 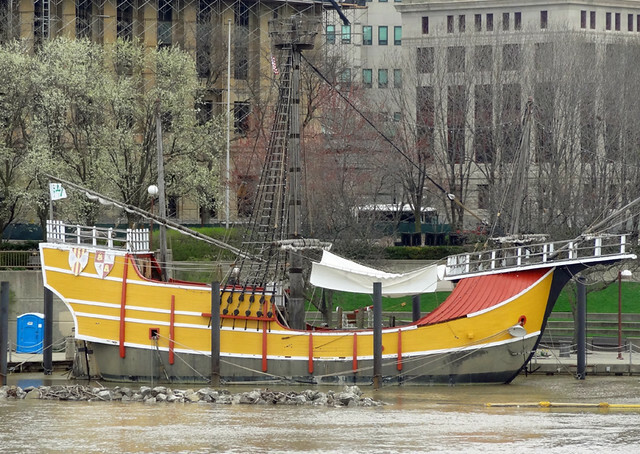 Since this is Columbus, named after the man who introduced America to Europeans, there’s a replica of the Santa Maria on the Scioto River. The tourist attraction is popular with children, who can go inside and hear the story of Columbus’s 1492 voyage to the New World. What, no love for the Nina or the Pinta? 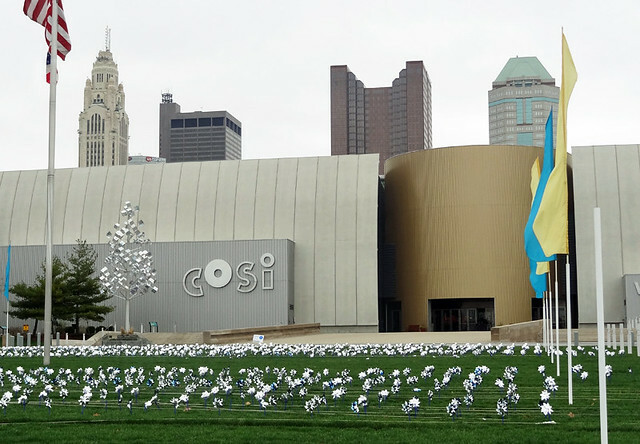 The COSI science center sits near the river and shows off both childish and mature sides of its personality, standing tall in front of the Columbus skyline with dozens of pinwheels in the grass. 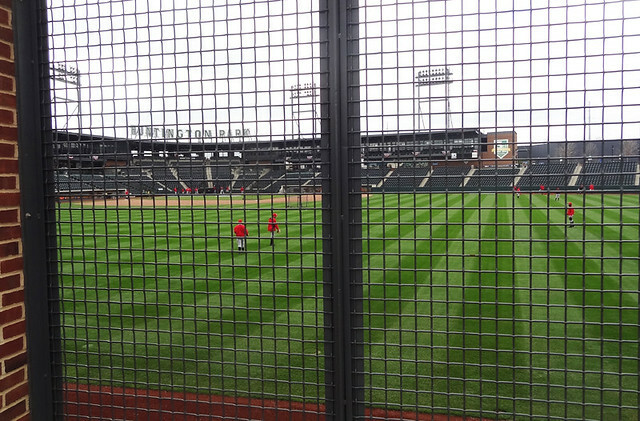 The baseball stadium has see-through fences in parts of the outfield where you can look right in and watch the action for free. Cool! Random fun fact about Columbus: It’s the 15th-largest city in the USA. Columbus is bigger than Boston! It’s also bigger than Seattle, Miami, Atlanta, Denver, Washington DC, and Las Vegas. True, those other cities have much bigger metro areas, because a lot of their overall population is in the suburbs, but still… it’s something to brag about. 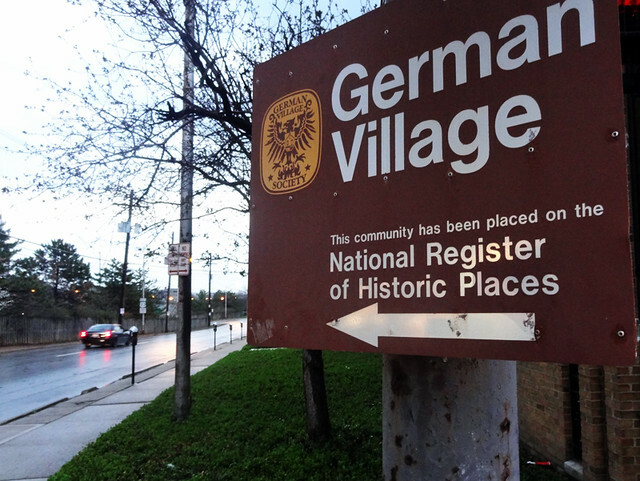 The German Village was a cool neighborhood with hot spots like the Book Loft and Harvest Pizzeria. 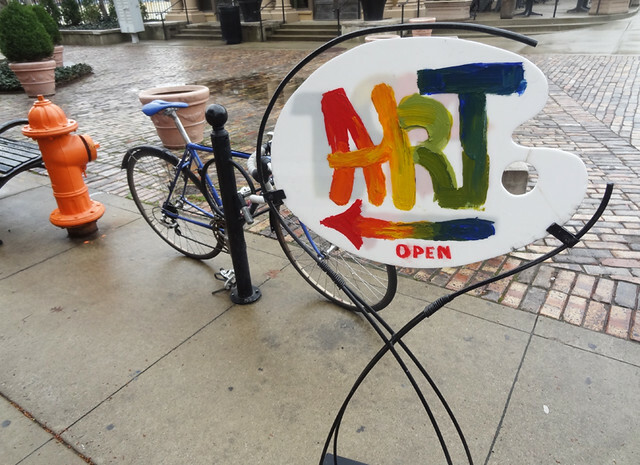 But I spent more time in the Short North, a vibrant ‘hood at all hours of the day. 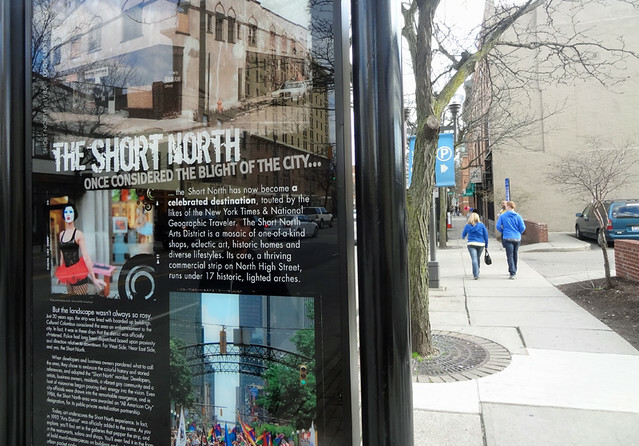 The historic information signposts in Columbus were more modern than most – with color photos! 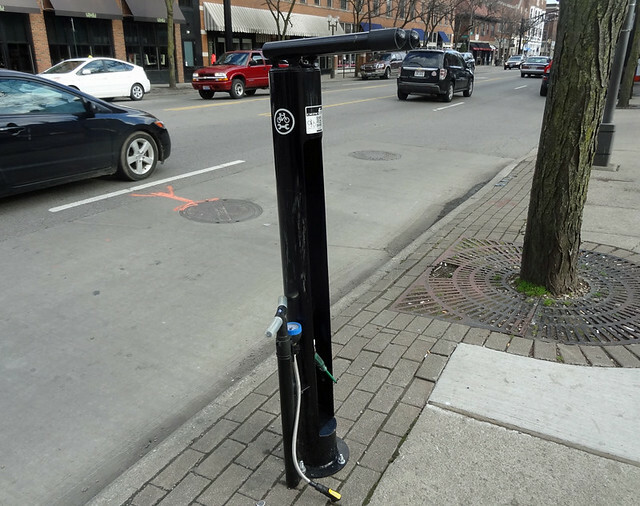 They even had bike pump machines on the sidewalk. What a great idea! We could seriously use these in Chicago. 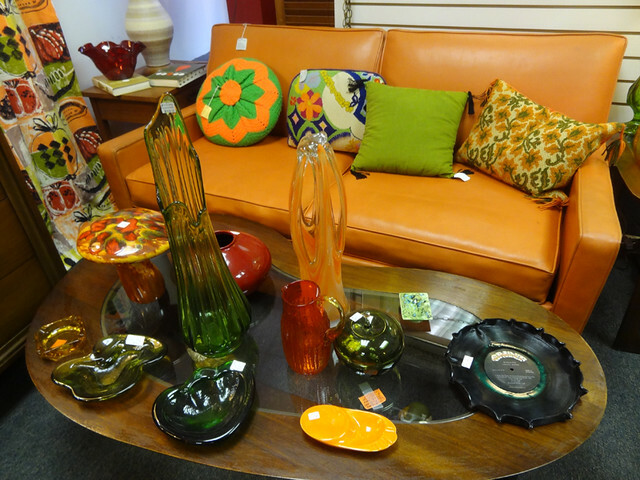 I loved the Flower Child vintage store. If it was possible, I would’ve bought up all the furniture in the store to decorate my apartment like this. Orange! 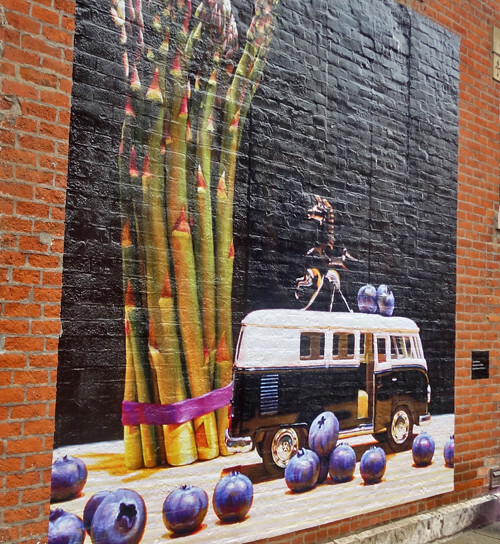 Interesting art was everywhere in Columbus, especially in the Short North. 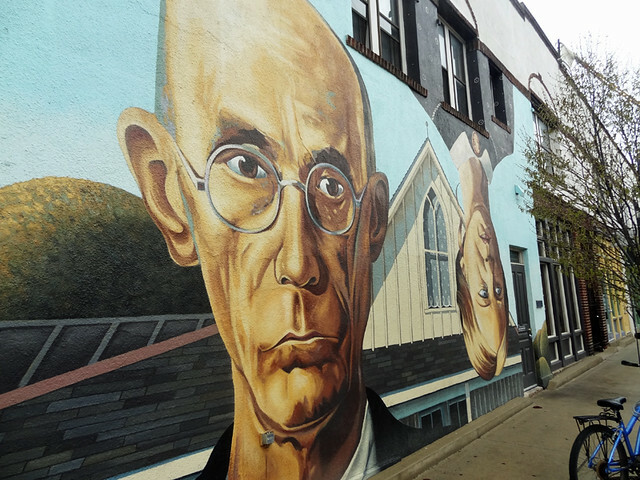 The quirky spirit of the area was captured in the weird re-imagined paintings of American classics. Like this American Gothic tribute with the woman flipped upside down. 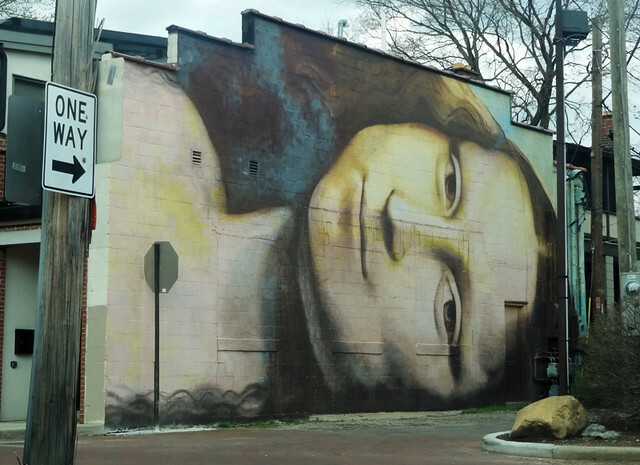 And the Mona Lisa, turned on her side. Before I left town, I stopped by an annual art celebration, where artists showed off their creations inside their own loft spaces. The display that caught everyone’s attention was this room full of balloons, which made for some awesome Instagramming. 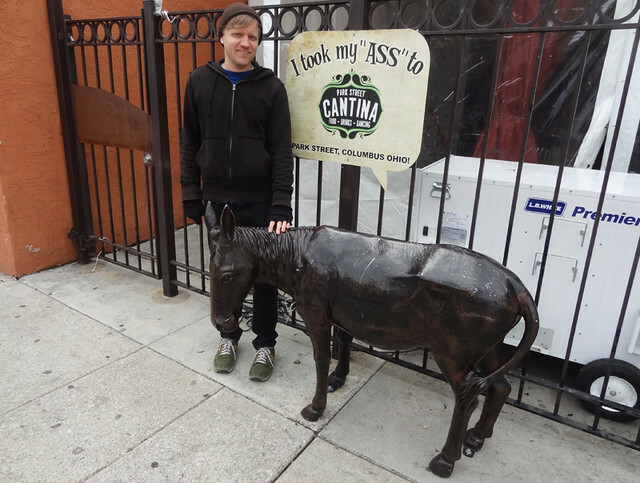 Columbus was one of the few cities I visited where I left with an immediate urge to go back. 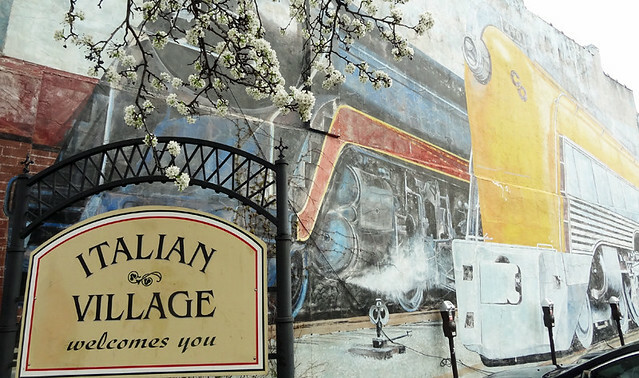 It’s a big city that feels smaller, and its neighborhoods are trendy and friendly. Fortunately, it’s only a Megabus ride away. I’ve lived all over the place – California, Indiana, Arizona and now just outside of DC – and the one place I feel the strongest affinity for is Ohio – specifically Columbus. Every place I’ve lived has a lot to offer, and maybe I’m biased because I’m from there, but I’m always a bit sad when I leave Columbus. It really is a great, great city. That’s cool – I feel the same way about my hometown. 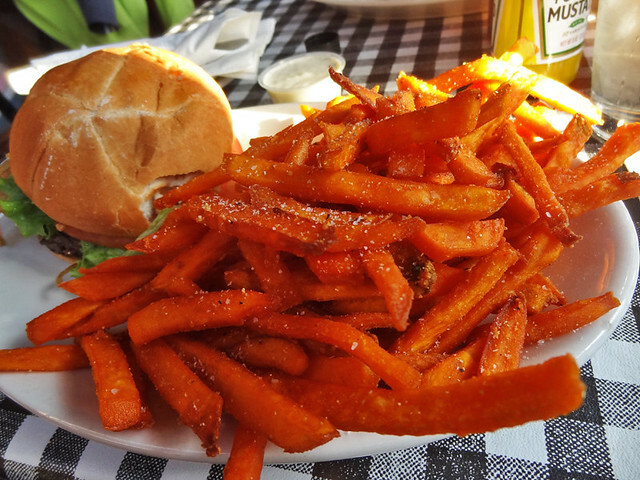 The fries look great – never had sweet potato fries before. 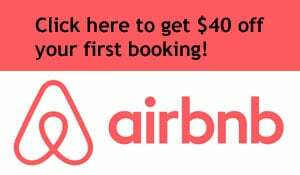 Looks like a great place to visit. Sweet potato fries are the best. Any bar that has them is a winner with me. Can you tell I’m not hard to please when it comes to food? 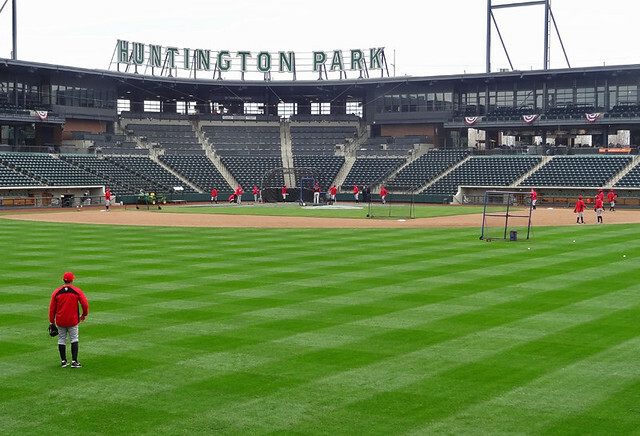 Columbus is under-rated by most. The conservatory is supreme. And, please tell me you tried a Buckeye — they are delicious when done right. 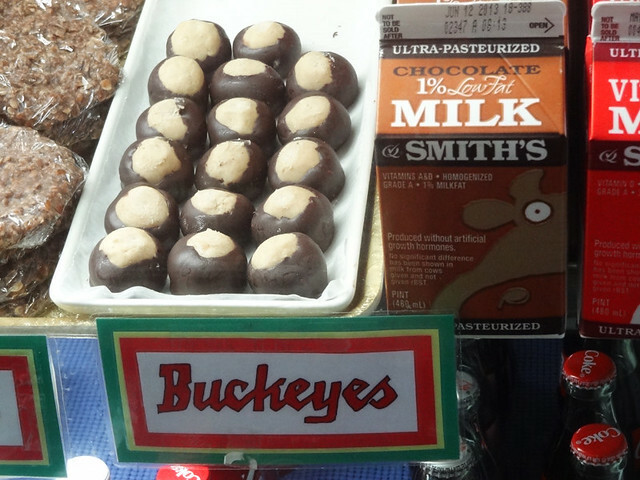 I did not try a buckeye at the market, but I’ve had them before. I eat way too many when they show up on the Christmas cookie trays!